Sancus Solutions is offering a one-day training course in conflict resolution. The course demonstrates tried-and-tested and easy to master methods of dealing with problematic situations. This training is aimed at equipping staff members with the necessary skills and knowledge to defuse potentially aggressive or violent situations which arise in the workplace. 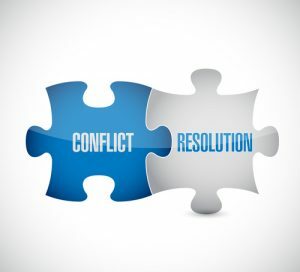 The primary advantage for organisations in training their staff in conflict resolution is the ensuring of safety for all parties involved, as well as avoiding any potentially protracted disputes which may be expensive and reputation damaging. How to successfully and safely handle a sudden confrontational situation. Our experienced trainers will demonstrate practical exercises and examples devised to give attendees real-world skills to use in the workplace to assess conflict risk, handle conflicts and prevent conflict from arising. Sancus Solutions is committed to delivering the very best in training for improving working practice. As a result our courses are designed to be as comprehensive and thorough as possible, equiping delegates with essential knowledge and constructive practical skills for implementation in the workplace. All courses are delivered by enthusiastic, engaging and highly qualified trainers who have a wealth of experience in their areas of expertise. This professionalism is invaluable in terms of conflict resolution training. Delegates will learn from trainers with substantial experience in the methods taught and will therefore leave the course with a solid and lasting new awareness of how to resolve conflict in the workplace in a professional and – most importantly – safe manner, no matter what specific industry their organisation represents.